Essential oils have been around for a long time in history. These are the extracts of different plants: leaves, bark, flower, or roots. They have been used in different cultures for medicinal and therapeutic reasons. Their benefits abound like healing pains, relieving stress, purifying air, killing bacteria, uplifting the mood, clearing sinuses, and improving sleep. These oils are used in different ways for gaining their maximum benefits, and a diffuser helps you to get the most out of essential oils. Diffusers work by dispersing essential oils into the air to be inhaled and absorbed by the body. These diffusers use various methods to disperse the essential oils containing water droplets into the air. Different types of diffusers are used for essential oils. Some of them are discussed here. These are the most commonly used diffusers these days. Ultrasonic diffusers send essential oils into the air through negative ions. These diffusers use ultrasonic waves for breaking down water and essential oils into microparticles and disperse the oil into the air as a very fine mist. These diffusers also work as a humidifier and can be useful especially in dry weather for maintaining the humidity level of an area. They don’t use heat to breakdown the essential oils. They have large water tanks and can work for hours nonstop. They are not as effective as nebulizing diffusers. Need to be cleaned regularly. Nebulizers are the most powerful type of diffusers. They do not dilute the oils in water. They also do not heat the oil for dispersing. These diffusers use an atomizer to create fine airborne particles of essential oils and blow them in the air. These types of diffusers are most effective for inhaling medicines. These diffusers attach to the bottle of essential oil. Essential oils are not diluted in these diffusers, therefore, release the strong scent into the air. You can place it on a timer to prevent oil from dispersing quickly. Use oil more quickly than ultrasonic diffusers. More expensive than ultrasonic diffusers. These diffusers use a fan to blow air across a damp and scented pad. As the water evaporates, the scent is also dispersed into the air. Diffuser pendant jewelry is also evaporative diffusers which diffuse the essential oil slowly with air. These diffusers heat the essential oils until the oil evaporates into the air. Many types of heat diffusers are used from electric heat diffusers to the more simple ones like candle heat diffusers. These are suitable for thick oils and may not work well for more sensitive oils. Some of the benefits of diffusers are listed here. • The safe way to use Essential oils: Diffuser is an easiest and safe way to make your home aromatic. These diffuse use only water and oil to spread the scent around the room. Other heating methods may cause danger for kids or pets around. • Health benefits: A diffuser helps you to utilize the maximum benefits from essential oils. Many essential oils have healing properties, and they put a profound effect on your health and mind. They are excellent for relieving anxiety and depression, improve sleep and concentration, and uplift your mood. • Purify the air and repel insects: A diffuser may be used for cleaning the air and killing bacteria and other pathogens from the air. Following things should be considered while buying a diffuser. Consider your area where you want to use the diffuser. A large reservoir will create enough mist to spread the aroma in large rooms or halls. While if you want to use a diffuser in a little room or office, then a small appliance will work fine. Some types of essential oils have a very strong aroma, and little mist is enough for making the room fragrant. A good diffuser allows you to determine how much mist you need in a room. Choose the diffuser which can be set from high mist to low mist production to suit your needs and preferences. Another feature that you may need in your diffuser is the timer. Timers allow you to set how long you want the diffuser to run. You can set the timer so that diffuser can stop after a while even if you are sleeping. It will save your oil from running out too. Make sure you choose a unit that does not create much noise. A noisy diffuser can disturb you at night if you are a light sleeper. So look for a quieter unit that does not distract your mind and provides peace of mind. A night light may seem appealing to some of us, but not everyone is a big fan of night light. Light may seem very bright at night. So make sure you can dim those light in diffusers or can completely turn it off if you prefer. Other features like auto shutoff can also help. Always choose a unit that is easy to clean and maintain. Here is our turn of recommending the best diffuser for your convenience. 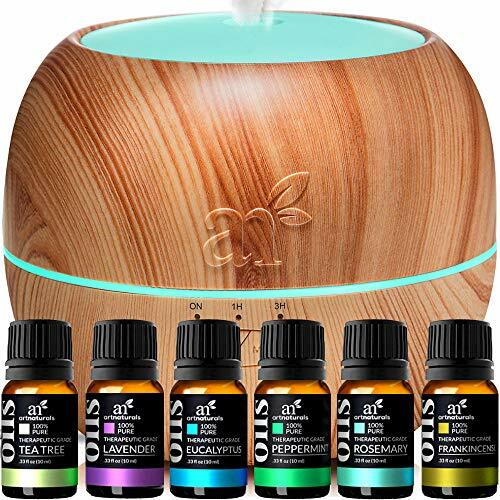 This ArtNaturals’ Aromatherapy Essential Oil and Diffuser Gift Set is certainly the best diffuser in the market. The diffuser comes with six most beneficial and popular essential oils, Lavender, Peppermint, Tea Tree, Frankincense, Eucalyptus or more. These oils can help you to relax, get good sleep, uplift your mood, purify the air of your room, and energize you for the whole day. The diffuser has a wood grain design that blends into the interior of your room and looks beautiful. The diffuser has enough capacity to spread the right amount of mist in an average room. 1. It’s a complete set of Diffuser with six essential oils. 2. All come at a very reasonable price. 3. The diffuser has a wood grain design that looks great. 4. A good investment for purifying air and getting the maximum benefits from the essential oil. 1. You may not need the oils and prefer buying them separately, but with this diffuser, they all come at a very affordable price.